The New Zealand Army (Māori: Ngāti Tūmatauenga, "Tribe of the God of War") is the land component of the New Zealand Defence Force and comprises around 4,500 Regular Force personnel, 2,000 Territorial Force personnel and 500 civilians. Formerly the New Zealand Military Forces, the current name was adopted by the New Zealand Army Act 1950. The New Zealand Army traces its history from settler militia raised in 1845. New Zealand soldiers served with distinction in the major conflicts in the 20th century, including the Second Boer War, World War I, World War II, the Korean War, the Malayan Emergency, Borneo Confrontation and the Vietnam War. Since the 1970s, deployments have tended to be assistance to multilateral peacekeeping efforts. Considering the small size of the force, operational commitments have remained high since the start of the East Timor deployment in 1999. New Zealand personnel also served in the First Gulf War, Iraq and Afghanistan, as well as several UN and other peacekeeping missions including the Regional Assistance Mission to Solomon Islands, the Sinai, South Sudan and Sudan. War had been an integral part of the life and culture of the Māori people. The Musket Wars dominated the first years of European trade and settlement. The first European settlers in the Bay of Islands formed a volunteer militia from which some New Zealand Army units trace their origins. British forces and Māori fought in various New Zealand Wars starting in the north of the country in 1845, and culminating in major campaign in the Waikato in the mid-1860s, during which settler forces were used with great effect. 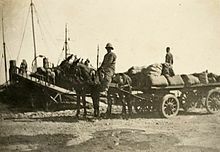 Towards the end of the war, the numbers of British troops were reduced, leaving settler units to continue the campaign. The first permanent military force was the Colonial Defence Force, which was active from 1862. This was replaced in 1867 by the Armed Constabulary, which performed both military and policing roles. After being renamed the New Zealand Constabulary Force, it was divided into separate military and police forces in 1886. The military force was called the Permanent Militia and later renamed the Permanent Force. Major Alfred William Robin led the First Contingent sent from New Zealand to South Africa to participate in the Boer War in October 1899. The New Zealand Army sent ten contingents in total (including the 4th New Zealand Contingent), of which the first six were raised and instructed by Lieutenant Colonel Joseph Henry Banks, who led the 6th Contingent into battle. These were mounted riflemen, and the first contingents had to pay to go, providing their own horses, equipment and weapons. The Defence Act 1909, which displaced the old volunteer system, remodelled the defences of the dominion on a territorial basis, embodying the principles of universal service between certain ages. It provided for a territorial force, or fighting strength, fully equipped for modern requirements, of thirty thousand men. These troops, with the territorial reserve, formed the first line; and the second line comprised rifle clubs and training sections. Under the terms of the Act, every male, unless physically unfit, was required to take his share of the defence of the dominion. The Act provided for the gradual military training of every male from the age of 14 to 25, after which he was required to serve in the reserve up to the age of thirty. From the age of 12 to 14, every boy at school performed a certain amount of military training, and, on leaving, was transferred to the senior cadets, with whom he remained, undergoing training, until 18 years of age, when he joined the territorials. After serving in the territorials until 25 (or less if earlier reliefs were recommended), and in the reserve until 30, a discharge was granted; but the man remained liable under the Militia Act to be called up, until he reached the age of 55. As a result of Lord Kitchener's visit to New Zealand in 1910, slight alterations were made—chiefly affecting the general and administrative staffs, and which included the establishment of the New Zealand Staff Corps—and the scheme was set in motion in January, 1911. Major-General Sir Alexander Godley, of the Imperial General Staff, was engaged as commandant. In World War I New Zealand sent the New Zealand Expeditionary Force (NZEF), of soldiers who fought with Australians as the Australian and New Zealand Army Corps at Gallipoli, subsequently immortalised as "ANZACs". The New Zealand Division was then formed which fought on the Western Front and the New Zealand Mounted Rifles Brigade fought in Palestine. After Major General Godley departed with the NZEF in October 1914, Major General Alfred William Robin commanded New Zealand Military Forces at home throughout the war, as commandant. The total number of New Zealand troops and nurses to serve overseas in 1914–1918, excluding those in British and other dominion forces, was 100,000, from a population of just over a million. Forty-two percent of men of military age served in the NZEF. 16,697 New Zealanders were killed and 41,317 were wounded during the war—a 58 percent casualty rate. Approximately a further thousand men died within five years of the war's end, as a result of injuries sustained, and 507 died whilst training in New Zealand between 1914 and 1918. New Zealand had one of the highest casualty—and death—rates per capita of any country involved in the war. In World War II, the 2nd Division, fought in Greece, Crete, the Western Desert Campaign and the Italian Campaign. Among its units was the famed 28th Māori Battalion. Following Japan's entry into the war, 3rd Division, 2 NZEF IP (in Pacific) saw action in the Pacific, seizing a number of islands from the Japanese. New Zealanders contributed to various Allied special forces units, such as the original Long Range Desert Group in North Africa and Z Force in the Pacific. As part of the preparations for the possible outbreak of war in the Pacific, the defensive forces stationed in New Zealand were expanded in late 1941. On 1 November, three new brigade headquarters were raised (taking the total in the New Zealand Army to seven), and three divisional headquarters were established to coordinate the units located in the Northern, Central and Southern Military Districts. The division in the Northern Military District was designated the Northern Division, and comprised the 1st and 12th Brigade Groups. Northern Division later became 1st Division. 4th Division was established in the Central Military District (with 2nd and 7th brigades), and 5th in the south (with 3rd, 10th and 11th brigades). The forces stationed in New Zealand were considerably reduced as the threat of invasion passed. During early 1943, each of the three home defence divisions were cut from 22,358 to 11,530 men. The non-divisional units suffered even greater reductions. The New Zealand government ordered a general stand-down of the defensive forces in the country on 28 June, which led to further reductions in the strength of units and a lower state of readiness. By the end of the year, almost all of the Territorial Force personnel had been demobilised (though they retained their uniforms and equipment), and only 44 soldiers were posted to the three divisional and seven brigade headquarters. The war situation continued to improve, and the 4th Division, along with the other two divisions and almost all the remaining Territorial Force units, was disbanded on 1 April 1944. The 6th New Zealand Division was also briefly formed as a deception formation by renaming the NZ camp at Maadi in southern Cairo, the New Zealanders' base area in Egypt, in 1942. In addition, the 1st Army Tank Brigade (New Zealand) was also active for a time. The New Zealand Army was formally formed from the New Zealand Military Forces following the Second World War. Attention focused on preparing a third Expeditionary Force potentially for service against the Soviets. Compulsory military training was introduced to man the force, which was initially division-sized.The New Zealand Army Act 1950 stipulated that the Army would consist from then on of Army Troops (army headquarters, Army Schools, and base units); District Troops (Northern Military District, Central and Southern Military Districts, the 12 subordinate area HQs, elementary training elements, coastal artillery and composite AA regiments); and the New Zealand Division, the mobile striking force. The division was alternatively known as '3NZEF'. The Army's first combat after the Second World War was in the Korean War, which began with North Korea's invasion of the South on 25 June 1950. 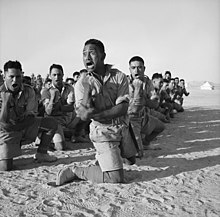 After some debate, on 26 July 1950, the New Zealand government announced it would raise a volunteer military force to serve with the United Nations Command in Korea. The idea was opposed initially by Chief of the General Staff, Major-General Keith Lindsay Stewart, who did not believe the force would be large enough to be self-sufficient. His opposition was overruled and the government raised what was known as Kayforce, a total of 1,044 men selected from among volunteers. 16th Field Regiment, Royal New Zealand Artillery and support elements arrived later during the conflict from New Zealand. The force arrived at Pusan on New Year's Eve, and on 21 January, joined the British 27th Infantry Brigade. The New Zealanders immediately saw combat and spent the next two and a half years taking part in the operations which led the United Nations forces back to and over the 38th Parallel, later recapturing Seoul in the process. Through the 1950s, New Zealand Army forces were deployed to the Malayan Emergency, and the Confrontation with Indonesia. A Special Air Service squadron was raised for this commitment, but most forces came from the New Zealand infantry battalion in the Malaysia–Singapore area. The battalion was committed to the Far East Strategic Reserve. The 1957 national government defence review directed the discontinuation of coastal defence training, and the approximately 1000 personnel of the 9th, 10th, and 11th coastal regiments Royal New Zealand Artillery had their compulsory military training obligation removed. A small cadre of regulars remained, but as Henderson, Green, and Cook say, 'the coastal artillery had quietly died.' All the fixed guns were dismantled and sold for scrap by the early 1960s. After 1945, the Valentine tanks in service were eventually replaced by about ten M41 Walker Bulldogs, supplemented by a small number of Centurion tanks. Eventually, both were superseded by FV101 Scorpion armoured reconnaissance vehicles. New Zealand sent troops to the Vietnam War in 1964 because of Cold War concerns and alliance considerations. The New Zealand Division was disbanded in 1961, as succeeding governments reduced the force, first to two brigades, and then a single one. This one-brigade force became, in the 1980s, the Integrated Expansion Force, to be formed by producing three composite battalions from the six Territorial Force infantry regiments. In 1978, a national museum for the Army, the QEII Army Memorial Museum, was built at Waiouru, the Army's main training base in the central North Island. After the 1983 Defence Review, the Army's command structure was adjusted to distinguish more clearly the separate roles of operations and base support training. There was an internal reorganisation within the Army General Staff, and New Zealand Land Forces Command in Takapuna was split into a Land Force Command and a Support Command. Land Force Command, which from then on comprised 1st Task Force in the North Island and the 3rd Task Force in the South Island, assumed responsibility for operational forces, Territorial Force manpower management and collective training. 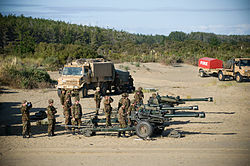 Support Command which from then on comprised three elements, the Army Training Group in Waiouru, the Force Maintenance Group (FMG) based in Linton, and Base Area Wellington (BAW) based in Trentham, assumed responsibility for individual training, third line logistics and base support. Headquarters Land Force Command remained at Takapuna, and Headquarters Support Command was moved to Palmerston North. The Army was prepared to field a Ready Reaction Force which was a battalion group based on 2/1 RNZIR; the Integrated Expansion Force (17 units) brigade sized, which would be able to follow up 90 days after mobilization; and a Force Maintenance Group of 19 units to provide logistical support to both forces. The battalion in South East Asia, designated 1st Battalion, Royal New Zealand Infantry Regiment by that time, was brought home in 1989. In the late 1980s, Exercise Golden Fleece was held in the North Island. It was the largest exercise for a long period. During the later part of the 20th century, New Zealand personnel served in a large number of UN and other peacekeeping deployments, including the United Nations Truce Supervision Organisation in the Middle East, Operation Agila in Rhodesia, the Multinational Force and Observers (MFO) in the Sinai, Cambodia, Somalia, Bosnia, Sierra Leone, Mozambique, Angola, Bosnia, Bougainville, the Regional Assistance Mission to Solomon Islands, and the Sudan. In the 21st century, New Zealanders have served in East Timor (1999 onwards), Afghanistan, and Iraq. In 2003, the New Zealand government decided to replace its existing fleet of M113 armored personnel carriers, purchased in the 1960s, with the NZLAV, and the M113s were decommissioned by the end of 2004. An agreement made to sell the M113s via an Australian weapons dealer in February 2006 had to be cancelled when the US State Department refused permission for New Zealand to sell the M113s under a contract made when the vehicles were initially purchased. The replacement of the M113s with the General Motors LAV III (NZLAV) led to a review in 2001 on the purchase decision-making by New Zealand's auditor-general. The review found shortcomings in the defence acquisition process, but not in the eventual vehicle selection. In 2010, the government said it would look at the possibility of selling 35 LAVs, around a third of the fleet, as being surplus to requirements. On 4 September 2010, in the aftermath of the 2010 Canterbury earthquake, the New Zealand Defence Force deployed to the worst affected areas of Christchurch to aid in relief efforts and assist NZ police in enforcing a night time curfew at the request of Christchurch Mayor Bob Parker and Prime Minister John Key. NZ Army Day is celebrated on 25 March, the anniversary of the day in 1845 when the New Zealand Legislative Council passed the first Militia Act on 25 March 1845 constituting the New Zealand Army. ANZAC Day is the main annual commemorative activity for New Zealand soldiers. On 25 April each year the landings at Gallipoli are remembered, though the day has come to mean remembering the fallen from all wars in which New Zealand has been involved. While a New Zealand public holiday, it is a duty day for New Zealand military personnel, who, even if not involved in official commemorative activities are required to attend an ANZAC Day Dawn Parade in ceremonial uniform in their home location. Remembrance Day, commemorating the end of World War I on 11 November 1918, is marked by official activities with a military contribution normally with parades and church services on the closest Sunday. However, ANZAC Day has a much greater profile and involves a much higher proportion of military personnel. The various regiments of the New Zealand Army mark their own Corps Days, many of which are derived from those of the corresponding British regiments. Examples are Cambrai Day on 20 November for the Royal New Zealand Armoured Corps, St Barbara's Day on 4 December for the Royal Regiment of New Zealand Artillery. Iraq — Over 100 in a non-combat training mission to build the capacity of the Iraqi security forces working alongside the Australian Army based at Taji since 2015 as part of Operation Okra. Afghanistan — Mentoring at the Afghan National Army Officer Training Academy. The NZ Provincial Reconstruction Team (New Zealand) (NZ PRT), ended in April 2013. Middle East — 2 serving in the United Nations Truce Supervision Organization. South Sudan — At least 1 serving in the United Nations Mission in South Sudan. South Korea — At least 1 serving in the United Nations Command Military Armistice Commission. Uniforms of the New Zealand Army have historically followed the British Army Uniform pattern. The high crowned "lemon squeezer" hat was for decades the most visible national distinction. This was adopted by the Wellington Regiment about 1911 and became general issue for all New Zealand units during the latter stages of World War I. The different branches of service were distinguished by coloured puggaree or wide bands around the base of the crown (blue and red for artillery, green for mounted rifles, khaki and red for infantry etc.). The "lemon squeezer" was worn to a certain extent during World War II, although often replaced by more convenient forage caps or berets, or helmets. British-pattern battledress was worn until the 1960s, with "jungle greens", almost identical to the Australian Army's, being used as field wear. US-style M1 steel helmets were the standard helmet from 1960–2000 although the "boonie hat" was common in overseas theatres, such as in the Vietnam War. New Zealand forces also used the US PASGT helmet until 2009 after which the Australian Enhanced Combat Helmet became the standard issue helmet. British Disruptive Pattern Material (DPM) was adopted in 1980 as the camouflage pattern for clothing the colours of which were further modified several times to better suit New Zealand conditions. This evolved pattern is now officially referred to as New Zealand disruptive pattern material and is almost identical to Dutch DPM but without the dithering. In the 2000s a desert DPM pattern, also based on the British pattern was in use with New Zealand peacekeeping forces in Iraq and Afghanistan. NZ SAS soldiers serving in Afghanistan were issued with Australian-sourced uniforms in MultiCam camouflage. NZDPM and NZDDPM were replaced in 2013 by the New Zealand Multi Terrain Camouflage Uniform (MCU) for all branches of NZDF. The MCU brings the New Zealand uniform more in line with the style of the Army Combat Uniform originating with and popularized by the United States and widely adopted internationally. The pants are based on the Crye G3 combat pant with removable knee pads. The MCU, with the addition of a beret or sometimes the Mounted Rifles Hat, is now the working uniform. In recent years, a number of distinctive New Zealand features have appeared, while at the same time corps and regimental distinctions have been reduced in favor of standardised items of dress for reasons of supply rationalization and economy. Until 2002, berets were in various colours according to branch or unit. Since then, under a "one beret" policy, rifle-green has become the universal colour for this headdress, except for the tan beret of the New Zealand Special Air Service and the blue beret of the New Zealand Defence Force Military Police. On overseas service, a New Zealand flag badge and a white Kiwi on a circular black field with the words "New Zealand" are worn. The "lemon squeezer", after being in abeyance since the 1950s, was reintroduced for ceremonial wear in 1977. Officer cadets and the New Zealand Army Band wear this headdress with a scarlet and blue full dress uniform. A wide brimmed khaki hat with green puggaree, of a pattern formerly worn by the New Zealand Mounted Rifle regiments, replaced the khaki "No 2" British Army peaked cap as service dress headdress for all branches in 1998. In 2012, it was announced that the MRH (Mounted Rifle hat) was to become the standard Army ceremonial headdress with the "lemon squeezer" being retained only for colour parties and other limited categories. The dark blue (formerly red) sashes worn by sergeants are now embroidered with a traditional Māori motif or mokowaewae denoting speed and agility. On the infantry sash, the mokowaewae appears in black, white and red diagonal 'steps', and on that of the New Zealand Scottish, in green, black and white. Short Māori cloaks are sometimes worn by senior officers as a mark of distinction on occasions of special ceremony, though they are not part of the regulation uniform. The British "infantry pattern" mess uniform is still worn by officers and senior NCOs for formal evening occasions. A universal pattern comprising scarlet mess jackets and blue-black trousers has replaced the various regimental and corps mess dress uniforms previously worn. The universal mess dress has also replaced the white jacket and black Barathea trousers previously worn in summer or tropical climates. The dark blue No 1 dress formerly worn by officers, before the general adoption of mess uniforms, was last worn in the early 1990s, although it was nominally retained for wear by the chief of army on appropriate state occasions. Highland orders of dress (glengarry, kilt, and sporrans) are authorised for wear by the New Zealand Scottish Squadron of the RNZAC, at the discretion of the squadron commander. They are also authorised for the pipes and drums of the 5th (Wellington, West Coast and Taranaki) Battalion Group. The New Zealand Army is commanded by the Chief of Army (Chief of the General Staff until 2002), who is a major general or two-star appointment. The current Chief of Army is Major General Dave Gawn. The Chief of Army has responsibility for raising, training and sustaining those forces necessary to meet agreed government outputs. For operations, the Army's combat units fall under the command of the land component commander, who is on the staff of the COMJFNZ at Headquarters Joint Forces New Zealand at Trentham in Upper Hutt. Forces under the land component commander include the 1st Brigade and 1 NZ SAS Group. No. 3 Squadron RNZAF provides tactical air transport support. The Territorial Force (TF), the long established reserve component of the New Zealand Army, has as of 2009–2010 been renamed the Army Reserve, in line with other Commonwealth countries, though the term "Territorial Force" remains the official nomenclature in the Defence Act 1990. It provides individual augmentees and formed bodies for operational deployments. There are Reserve units throughout New Zealand, and they have a long history. The modern Army Reserve is divided into three regionally-based battalion groups. Each of these is made up of smaller units of different specialities. The terms 'regiment' and 'battalion group' seem to be interchangeably used, which can cause confusion. However, it can be argued that both are accurate in slightly different senses. In a tactical sense, given that the Reserve units are groupings of all arms, the term 'battalion group' is accurate, though usually used for a much more single-arm heavy grouping, three infantry companies plus one armoured squadron, for example. NZ reserve battalion groups are composed of a large number of small units of different types. The term 'regiment' can be accurately applied in the British regimental systems sense, as all the subunits collectively have been given the heritage of the former NZ infantry regiments (1900–1964). TF regiments prepare and provide trained individuals in order to top-up and sustain operational and non-operational units to meet directed outputs. TF regiments perform the function of a training unit, preparing individuals to meet prescribed outputs. The six regiments command all Territorial Force personnel within their region except those posted to formation or command headquarters, Military Police (MP) Company, Force Intelligence Group (FIG) or 1 New Zealand Special Air Services (NZSAS) Regiment. At a minimum, each regiment consists of a headquarters, a recruit induction training (RIT) company, at least one rifle company, and a number of combat support or combat service support companies or platoons. 3/1st Battalion, Royal New Zealand Infantry Regiment, previously existed on paper as a cadre. If needed, it would have been raised to full strength through the regimentation of the Territorial Force infantry units. Army plans now envisage a three manoeuvre unit structure of 1 RNZIR, QAMR, and 2/1 RNZIR (light), being brought up to strength by TF individual and subunit reinforcements. The New Zealand Cadet Corps also exists as an army-affiliated youth training and development organisation, part of the New Zealand Cadet Forces. A rationalisation plan to amalgamate the then existing six Reserve Regiments to three, and to abolish one third of Reserve personnel posts, had been mooted for some years. This was finally agreed by the New Zealand government in August 2011, and was implemented in 2012. The Territorial Forces Employer Support Council is an organisation that provides support to Reserve personnel of all three services and their civilian employers. It is a national organisation appointed by the minister of defence to work with employers and assist in making Reserve personnel available for operational deployments. Unimog trucks. Introduced over 8 years from 1981, the New Zealand Army procured 210 x 1.5T U1300L Unimogs and 412 x 4T U1700L Unimogs, which after 30 years of service, are to be replaced by MAN trucks. MB2228/41 trucks. Introduced over 8 years from 1981, the New Zealand Army procured 228 x 8T Mercedes Benz MB2228/41, are to be replaced by MAN trucks. Mercedes-Benz Actros In 2010 New Zealand purchased 4 Actros to haul adjustable-width quad-axle low-loader semitrailers primarily for the transportation of LAVs (Light Armoured Vehicles). JCB HMEE The NZ Army has six High Mobility Engineer Excavators (HMEEs) (also known as the Combat Engineer Tractor), which were delivered in January 2011. MAN HX trucks were acquired as part of a project to purchase 194 Medium and Heavy Operational Vehicles to replace the in-service medium and heavy trucks. The MHOV fleet has a mix of: 4 x 4, 6 tonne (115 HX60); 6 x 6, 9 tonne (58 HX58); and 8 x 8, 15 tonne (16 HX77) variants along with 8 x 8 (5 HX77) heavy equipment transporters planned to be capable of moving 30 tonne. The fleet is fitted with a mix of integrated Hiab cranes and self recovery winches, increasing flexibility on the battlefield and allowing self load/unload. The replacement program is to be completed in 2017. M1089 Wrecker. Introduced in 1999 the NZ Army operates 5 US made FMTV A1 R M1089 A1 5-ton Wreckers. Matbro Forklift. Introduced in 1999 the NZ Army operates 16 Matbro TS280, 2 5 tonne lift capacity Rough Terrain Forklift. These are wheeled 4 x 4 vehicles, capable of 2 wheel 4 wheel and crab steering. The Matbro has a quick change device that allows the vehicle to be converted from standard forks to extended forks or a multipurpose bucket that give the vehicle great versatility. Skytrak Forklift. Introduced in 1995, the NZ Army operates 11 SkyTrak Rough Terrain Forklifts. Karcher Field Kitchen. The NZ Army operates the Karcher Tactical Field Kitchen TFK which is a trailer mounted mobile kitchen unit comprising two pressure cookers two pressure roasters two ovens and two water boilers with heat supplied from four burners using a diesel and kerosene fuel mix The TFK has the capacity to produce up to 250 set meals or 500 hotbox meals within a two-hour period. Rifle 5.56mm LMT MARS-L  8,800 CQB16 5.56 rifles with 406mm Barrels and spares. FN MAG 58 7.62 mm. Benelli M3 12 gauge Shotgun. M2HB machine gun – .50 Calibre / 12.7mm Heavy Machine Gun. L129A1 7.62mm Designated Marksman Weapon (DMW) from Lewis Machine Tools. Uses the LMT 308 MWS system. Heckler & Koch GMG 40mm automatic grenade launcher. ^ IISS MIlitary Balance 2011, 263: ISAF, Multinational Force and Observers , 1 obs in UNAMI, 7 UNTSO, Sudan, RAMSI, and ISF in Timor. ^ Stowers, Richard, Kiwi versus Boer: The First New Zealand Mounted Rifles in the Anglo-Boer War 1899–1902, 1992, Hamilton: Richard Stowers. ^ "Barrowclough, Harold Eric". Dictionary of New Zealand Biography. Ministry for Culture and Heritage / Te Manatū Taonga. Retrieved 14 July 2012. ^ Cooke, Peter; Crawford, John (2011). The Territorials: The History of the Territorial and Volunteer Forces of New Zealand. Auckland: Random House. pp. 272–281. ISBN 9781869794460. ^ Henderson, Green, and Cook, 2008, 374. ^ Report of the Naval Board of the Defence Council from 31 March 1983 – 1 April 1984 via Communicators' Association website. ^ a b c "Defence Force Mission In Afghanistan – A Significant Contribution". New Zealand Defence Force. 24 April 2013. Retrieved 13 August 2016. ^ a b Keating, Chief of Defence Force Lt. Gen. Tim (24 February 2015). "NZDF's Training Mission to Iraq". New Zealand Defence Force. Retrieved 13 August 2016. ^ "NZ Army – Welcome to the New Zealand Army – Ngati Tumatauenga". New Zealand Army. ^ "US blocks APC sale – Politics News". Television New Zealand. 20 February 2006. Archived from the original on 2 May 2015. ^ "Govt to sell 35 army LAVs". 24 May 2010. ^ "Weather the next threat after earthquake". Stuff.co.nz (Fairfax New Zealand). 4 September 2010. Archived from the original on 25 June 2012. Retrieved 4 September 2010. ^ "Operation Christchurch Quake 2011". NZ Army. Archived from the original on 13 August 2011. ^ Ashley), Corbett, D. A. (David (1980). The regimental badges of New Zealand, an illustrated history of the badges and insignia worn by the New Zealand Army (Rev. and enl. ed.). Auckland,: R. Richards. ISBN 0908596057. OCLC 14030948. ^ a b c d "NZ Army Deployments" (PDF). New Zealand Army. February 2015. Retrieved 13 August 2016. ^ "Multi-terrain Camouflage Uniform (MCU)". New Zealand Army. ^ "MCU Trg Pants by bolty". Photobucket. ^ "NZ Army – Org Chart". New Zealand Army. Retrieved 24 May 2011. ^ "LOV (Light Operational Vehicle)". NZ Army. Retrieved 22 July 2015. ^ "Light Operational Vehicle". defense-aerospace.com. Briganti et Associes. Retrieved 22 July 2015. ^ a b "NZ Naval Report to the Defence Council – 1982". rnzncomms.org. Retrieved 17 Apr 2017. ^ a b "Truck Deal Driving Defence Into The Future". NZDF. ^ a b "Medium and Heavy Operational Vehicles". defence.govt.nz. ^ "Cutting-edge Technology For New Army Actros Tractors" (PDF). mercedes-benz.co.nz. Retrieved 17 Apr 2017. ^ "army capability" (PDF). NZ Army. Retrieved 17 Apr 2017. ^ "New Zealand Army takes delivery of first 40 trucks from Rheinmetall MAN Military Vehicles Australia". 17 December 2013. Archived from the original on 26 December 2013. ^ a b c "Foreign Affairs, Defence and Trade Committee 2015/2016 Financial Review – Vote: Defence Force". www.parliament.nz. Retrieved 17 Apr 2017. ^ "NZ Army – Karcher Field Kitchen". archive-nz.com. Retrieved 17 Apr 2017. ^ "Individual Weapon Replacement". defence.govt.nz. Archived from the original on 18 August 2015. ^ "New Zealand Defence Force selects Glock 17 pistol | IHS Jane's 360". www.janes.com. Retrieved 2015-12-03. ^ a b "Defence Force buying two new weapons". ^ "Individual Weapon Replacement". defence.govt.nz. Cooke, Peter; Crawford, John (2011). The Territorials: The History of the Territorial and Volunteer Forces of New Zealand. Auckland: Random House. ISBN 9781869794460. Crawford, John; Harper, Glyn (2001). Operation East Timor: The New Zealand Defence Force in East Timor 1999– 2001. Auckland: Reed Publishing. ISBN 0790008238. A.E. Currie, Notes on the Constitutional History of the NZ Army from the Beginning to the Army Board Act, 1937, Crown Solicitors, March 1948, referenced in Peter Cooke, 'Defending New Zealand,' Part II. Wikimedia Commons has media related to New Zealand Army.